The industrial revolution gave us canals for transportation, introduced new ways to optimise agricultural endeavours, and increased iron production 30-fold. The rubber industry, too, experienced a huge change thanks to the invention of vulcanisation. Rubber curing (in a primitive format) has existed for centuries, and was mainly employed in prehistoric times by the Mesoamericans to make rubber balls and other objects. However, the modern vulcanisation process was not developed until the 19th century – its invention is mainly credited to Charles Goodyear, a self-taught American chemist. What is rubber curing (vulcanisation)? In its natural state, rubber is susceptible to warping, damage and abrasion from wear-and-tear, and erosion caused by acidic substances. In the early 1830s, Charles Goodyear began experimenting with ways to make rubber products from the Roxbury manufacturing plant more resilient, as thousands of articles were being returned due to rot and stickiness. 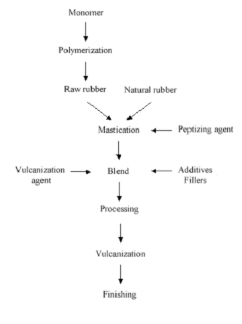 By treating rubber with heat and various other substances such as sulphur, Goodyear and several other rubber scientists across the globe (namely Hancock and Mackintosh, UK) found that the rubber would become resistant to acidic wear-and-tear, rot, and stickiness. What is the modern vulcanisation process? The modern vulcanisation process builds on Goodyear’s principles, resulting in a repeatable process that is now used the world over. Goodyear is also credited with the concept of using an accelerator to speed up the process, making it more efficient. The vulcanisation process cross-links rubber molecules with sulphur atoms (or those of other additives), making the resulting material harder, sturdier, and more resilient. The most common vulcanisation methods depend mostly on sulphur – Goodyear’s initial choice. However, vulcanisation of natural rubber using sulphur is a slow process which does not match up to the technological advancements of today. Because of this, modern sulphuric vulcanisation processes involve additional accelerants which are added as part of a ‘cure package’. A cure package will typically contain accelerators, activators (like zinc oxide and stearic acid), and antidegradants. Accelerators and activators act as catalysts to speed up the vulcanisation process, while antidegradants prevent the finished product from degradation by oxygen, ozone, and heat. Polychloroprene rubber (also known as neoprene) is a hugely useful rubber product, commonly used in apparel like swimming caps due to its significant elasticity. To vulcanise neoprene, metal oxides such as Magnesium Oxide (MgO) and Zinc Oxide (ZnO) are used. This process requires a specific type of accelerator, the most effective of which is currently ethylene thiourea (ETU). Unfortunately, though this accelerator works brilliantly to speed up the vulcanisation process, it is a reprotoxic substance. The European rubber industry project SafeRubber aims to develop a safer alternative to ETU. To vulcanise silicones, reactive oil-based polymers are combined with strengthening mineral fillers, in one of two ways. RTV-1 uses a one-component system. This process causes the silicone to harden due to atmospheric humidity, a catalyst, and acetoxysilane. RTV-2 uses a two component system. This process cures silicone at room temperature, resulting in a solid elastomer a gel, or a flexible foam. If you need a rubber company capable of producing a variety of different rubber materials for every application, give Aquaseal Rubber a call on 0191 266 0934, or drop an email to enquiries@aquasealrubber.co.uk. We look forward to working with you!